In my previous post The Master Gardeners Program I wrote about all of the new information I was assimilating. Being a long time gardener in South Florida I possess a bit of knowledge about all sorts of gardening, but there were some persistent mysteries for me. One particularly irritating gap in my knowledge was concerning PH and why whenever I made a soil nutrient inquiry with the Cooperative Extension, or with any educated grower the conversation immediately turned to PH. PH! Why PH? I want to ask about soil nutrients, and they just want to talk about PH! So what if my soil is alkaline, neutral, or acidic? I just wanted to know what nutrients the soil needed to grow good plants. If this was all that I learned in the Master Gardeners program it alone would be worth the time and money spent on that class. This is such a gem! 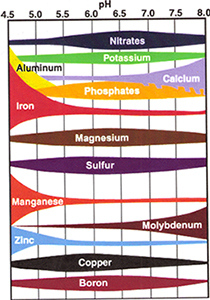 Here is why PH matters when talking about soil nutrition: Soil nutrients are only available to plants at certain and specific PH levels. The chart you see above tells it all. You see, a plant could be showing symptoms of a phosphorus deficiency while the soil in which it grows is packed with phosphorus. If the PH is not between 5.3 and 6.8 phosphorus will not be available to the plant. You can see in that chart above how past 6.8 phosphorus and calcium bind. Above 6.8 plants will have trouble with the bound up phosphorus and calcium. Below 5.5 phosphorus availability drops off a great deal. You can see on the chart above that Iron and Manganese don’t become available until a PH of 5.5 or lower. Plants that need a great deal of those nutrients, like Blueberries, and Ixora will benefit from an acidic soil. So you see when we talk about a plant loving acidic or alkaline or neutral soil we are really talking about what nutrients that plant needs to find available in soil to thrive. Once you have a PH reading on your soil then you can consider or test further for what nutrition it may need. On a recent soil test I submitted to the University I found that my compost based garden soil was off the charts for all of the nutrients for which they can test and my PH is 7.4. That is just a bit past neutral toward Alkalinity. My vegetables are growing great in that soil, and this information helps me to chart my course for the summer or fallow season. I plan to plant some cover crops like peanuts and peas on some sections which will help bring nitrogen in, and keep weeds out. I will probably add manure to the sections I let go fallow, but I will take it easy on the leaves and straw in the hopes of bringing the PH down just a little. When I am brewing compost I will go a bit heavier on the green or nitrogen heavy additives like manures and green plant wastes. The ideal PH for vegetable gardens is 5.8 to 6.5. Adding organic materials in the form of composts and composted manures is a great way to ensure that your soil has all of the nutrients that plants need. Doing a PH test is an invaluable tool for a gardener in the know. Next: Next post: Dear Christine, Another Master Gardeners Article! The test results are always interesting and sometimes show some wacky results that I have no explantion for and just ignore as the plants seem fine and are producing well. This may not be the best course of action but without a degree in soil chemistry and it quite possibly be an error in my sampling or in the testing…Sometimes just looking at the plant itself can tell you what a deficiency (or toxicity) might be. I also have to keep in mind the water used to irrigate can affect the pH. I use well water that is high in carbonates such as shell that will raise the pH. Very interesting stuff without getting too terribly technical. I do leaf sampling some too. Which is best done a certain time of year. I imagine soil or media testing can be done anytime? How heavy on the non-organics did the Master Gardener course end up being? I have had a heck of a time trying to get good solid scientific info on growing blueberries without synthetics (as much as possible). I have had good luck so far with trial and error except for a fungus that organic controls are ineffective on. But I wonder what these large scale organic growers do for this fungus? Like I said I haven’t found a blueberry person in IFAS that was much help in the organic area. Thanks for your comment Christine. You and Kari are the biggest Florida Blueberry growers I know, so I don’t know if I can find out anything that will help you but I am going to make some inquiries down here into your fungus control issue. I believe deeply that a growing medium, (soil) packed with living organisms is the best way to keep plants healthy and resistant to attacks. Are you growing in the ground or in containers? I don’t think it matters when a soil test is done relative to seasons. As I said in an earlier article I thought that in spite of some of the synthetic usage info I had to listen to the Master Gardeners program was a grand slam for me. I learned a great deal and made some excellent connections. Many of whom are like minded in regards to synthetic manipulations, and even some who work for the extension who feel like I do that the very minimum of manipulations in the garden is best. I plan to stay active in the Master Gardeners activities even beyond my voluntary obligations. Anthracnose (of which there are many) is my issue-Collectricum (sp) is the genus but I cannot remember off the top of my head what the species is. I have not had a lab confirm this but from my research and talking with bb extension agent this is safe to assume from visual observation of the fruit. It shrivels up into a flat spot with orange spores. University of Georgia has done research on organic control of this specific fungus and did not find any of the products they trialed to be effective. The internet has been incredible for little ol’ me to have access to papers and such which has been good to keep the trial and error to what I cannot find out from others experiments. Trial and error can be a costly endeavor when I am working with 1000 plants plus with my labor. And what works for a few plants doesn’t always translate to larger scale. I know that the way in which the plants are grown ie monocrop does not help with disease issues that come up but that is the way my father learned to grow many, many years ago at the University of Florida and he has stuck with it. It certainly keeps it simple and there are aspects about growing them in pots, on ground cloth, with micro-irrigation that very much appeal to me such as the much lower maintenance aspect- especially since I live 45 minutes away from where they are grown. It is hard for me to imagine having other crops intermingled with the berries without living down there to see to them. So I deal with issues from one crop. Anyhoo, just some more thoughts. Thanks for the details Christine. You really have done your homework. I will let you know what I find out.